Thanks to more than a decade-and-a-half of dedicated research, we have Aflasafe ready to broadcast onto Africa’s farms. And now, we are working on broadcasting the good news. 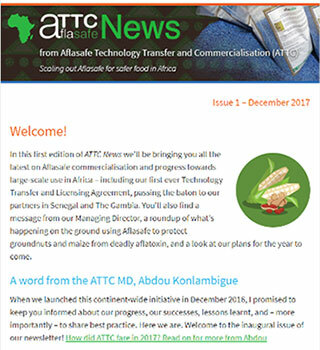 As part of our communication strategy for the Aflasafe Technology Transfer and Commercialization (ATTC) project, we launched our newsletter, ATTC News, last December. Issue 2 is coming out soon! We have covered lots of ground already, including our first ever Technology Transfer and Licensing Agreement (TTLA) and the construction of an Aflasafe factory in Senegal, our all-new website, and Aflasafe registration in Burkina Faso. We also established some regular features, like a message from our Managing Director and country-by-country roundups on our progress on Aflasafe commercialization and availability. Our mailing list is already over a thousand strong, and we are looking forward to reaching more and more people across Africa and beyond. If you have not yet signed up for our newsletter, you are in good time – visit us for a double whammy as you catch up on the first issue and join our subscribers in time to get Issue 2, coming soon. If you are on our list but haven’t seen the newsletter yet, remember to check your spam folder and make sure to add ATTCNews@aflasafe.com to your contacts list. As part of efforts to find out how well we are doing, we’ve also been asking our readers for feedback on our new website via a brief survey. So far, we have heard from a range of readers with interests from farming to the food industry. We’re delighted to note that they have rated our written content, navigation structure, and design from good to excellent—but what we have not heard much of yet is how we can improve, and what you would like to see more of as we continue to develop the website, which is growing all the time. We also have feedback buttons at the bottom of each page; please make use of them. With our partners, we are also working hard to reach out to the local press in the countries where we work, and so create public awareness on the dangers of aflatoxin and on the effective Aflasafe solution. One of our latest additions to the website is a press cuttings page, so come and see how Aflasafe is being talked about where you are. We are still adding more links to this page, but if you’ve spotted a mention of Aflasafe why not let us know? Another exciting recent communication release for us has been how-to guides for farmers in Nigeria, the first in a series that we have planned for every country where Aflasafe is available. These straightforward videos and leaflets explain how to use Aflasafe safely and effectively, as well as give an overview of Aflasafe and aflatoxin, in local languages—for Nigeria we have English, Pidgin, Hausa, Igbo, and Yoruba, and we have more countries in the pipeline. We would love to hear from you, so please do check out our website, take the survey, and make sure you are signed up to our mailing list. We are always happy to hear from anyone interested in Aflasafe, so drop us a line any time with your ideas for our website or newsletter, anything you’ve found particularly interesting, or any question you have. We’re speaking, but we’re always listening too! Previously published on Aflasafe blog.